A Very Unusual Explanation of AM and SSB -- What Do You Think? Before we illustrate SSB demodulation, it's useful to quickly review the nature of standard double-sideband amplitude modulation (AM) commercial broadcast transmissions that your car radio is designed to receive. In standard AM communication systems, an analog real-valued baseband input signal may have a spectral magnitude, for example, like that shown in Figure 2(a). Such a signal might well be a 4 kHz-wide audio output of a microphone having no spectral energy at DC (zero Hz). This baseband audio signal is multiplied, in the time domain, by a pure-tone carrier to generate what's called the modulated signal whose spectral magnitude content is given in Figure 2(b). In this example the carrier frequency is 80 kHz, thus the transmitted AM signal contains pure-tone carrier spectral energy at ±80 kHz. The purpose of a remote AM receiver, then, is to demodulate that transmitted DSB AM signal and generate the baseband signal given in Figure 2(c). The analog demodulated audio signal could then be amplified and routed to a loudspeaker. We note at this point that the two transmitted sidebands, on either side of ±80 kHz, each contain the same audio information. The purpose of a remote SSB receiver is to demodulate that transmitted SSB signal, generating the baseband audio signal given in Figure 3(c). The analog demodulated baseband signal can then be amplified and drive a loudspeaker. In a "lower sideband" (LSB) mode of SSB transmission, the transmitted analog signal would have the spectrum shown in Figure 4(b). In this case, the upper (lower) frequency edge of the baseband signal’s LSB (USB) has been translated in frequency so that it’s located at 80 kHz (-80 kHz). The baseband signal in Figure 4(a) is real-valued, so the positive-frequency portion of its spectrum is the complex conjugate of the negative-frequency portion. Both sidebands contain the same information, and that's why LSB transmission and USB transmission communicate identical information. And again, in the LSB mode of transmission, the remote receiver must demodulate that transmitted LSB SSB signal and generate the baseband audio signal given in Figure 4(c). Reading about the Photophone and modulating the Sun experiments by G3ZPF reminded me of my own schooldays when as a final year physics project I think in 1970, I and another pupil built a light modulated telephone based on a design published in Practical Wireless of June 1970 by J. Thornton Lawrence. For the optical system it used a pair of spherical mirrors from old projection televisions. The detector was the expensive (for a school kid) OCP71 photo transistor, though we did also try ordinary less expensive OC71 transistors with the black paint scraped off with less success. As David G3ZPF noted the problem with filament bulbs was the thermal inertia, and as I found it was also possible for the filament to mechanically resonate in the wooden box and start to howl. As we had never heard of, nor could have afforded an LED, we tried a Neon bulb run from an HT battery and modulated with a transformer in series with it. I recall coupling up a broadcast radio as the audio source playing "My Sweet Lord" by George Harrison and receiving it at the other end of the physics corridor very loud and clear on the audio amplifier on our light telephone receiver, much to the consternation and annoyance of the other teachers in the adjacent classrooms. I found my black and white photo of the light telephone gear, complete with carbon telephone microphone that we used. It did work a fairly good distance in daylight outside across the school playground, not just the couple of feet shown. Also attached are photos of the original magazine cover and index, but regrettably not the article itself. This was all before I got my ham ticket, but I already was a SWL and had been exposed to a wonderful ham, Tom GM3OWI (Oh Wild Indians) who visited the school and demonstrated all sorts of neat stuff like lighting a bulb from the output of a transmitter, and also voice modulating a klystron 3cm transmitter that the school had for doing electromagnetic radiation experiments, like polarisation, reflection etc. Come to think of it, we got to play with a lot of stuff at school in those days which would never be allowed now, mercury, radioactive sources, alpha, beta and gamma, X-Ray and UV. The museum in Edinburgh also had a science area with similar stuff you could play with, and get great shocks from the Van der Graff generator if you put your hand on the glass cabinet and touched the adjacent metal radiator! 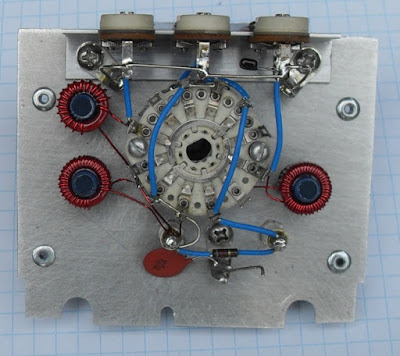 Yesterday David G3ZPF sent us another very interesting e-mail, this one about some very creative sunlight communication experimenting that he and his brother did many years ago. It appears to me that David -- on his own -- came up with a version of Alexander Graham Bell's Photophone (pictured above). Wikipedia says that Bell's invention was the first ever wireless telephony device. Bell credited Mr. A.C. Brown of London for the first demonstration of speech transmission by light (in 1878). I think young David's placement of the small mirror on the cone of the AF amplifier's loudspeaker was brilliant! Your story about using a laser pen in a receiver reminded me of my method of modulating light which I've never seen anyone else mention. In the mid 60's my brother had an electronics constructor set for his birthday. After the initial fascination I probably played with it more than him. I remember reading about modulated light transmitters and (because this was before I was anywhere near getting a licence) I decided to build one. My brother was sufficiently curious to help. We started with the receiver. I purchased an OCP71 and managed to find an old 12" headlight reflector from somewhere. The cork from a wine bottle fitted nicely into the hole at the centre, and the cork was easily drilled out to accommodate the photo-transistor. My brother constructed the "high gain audio amplifier" project from his constructor kit and we put two legs of the photo transistor across the mic input. We were rewarded by a buzzing sound so loud our parents yelled at us from the other room. It took us a few seconds to realise we were 'receiving' the 50Hz signal off the ceiling light (the house lights were on). Waving the headlight reflector around confirmed this. I still recall the excitement we felt at our 'discovery'. So far, so ordinary, but the TX side is where I wandered off into the outfield. Normally people modulated an incandescent bulb but this required a many watts of audio power & the 'inertia' of the filament could be a problem. I cannot remember what prompted me to do this, but next day I pulled the speaker grill off my tiny little medium wave transistor radio and glued a small mirror (from my mothers old 'compact') to the cone of the loudspeaker. Then we went outside into a field near our house. My brother went to the far end and I set up the lil radio on a camping stool. Moving it around until the sunlight reflected off the mirror hit the headlight reflector about 200 yards away. Then I turned on the radio. Instantly my brother started jumping up and down excitedly. It worked. My 200mW AF amp was modulating the *SUN* ! Looking from the receive end it was possible to see the light from the mirror flickering & I guess the movement of the speaker cone did not move the mirror exactly in the plane of the reflected beam. The 'wobble' fooled the phototransistor into seeing an amplitude modulated beam. The beauty of this was that only a tiny audio amp was needed. This made me wonder about such a system being used in undeveloped countries (ones with more sunshine) as a comms system, with batteries recharged by the sun. For the UK I thought about using a slide projector to provide the illumination, instead of the sun. 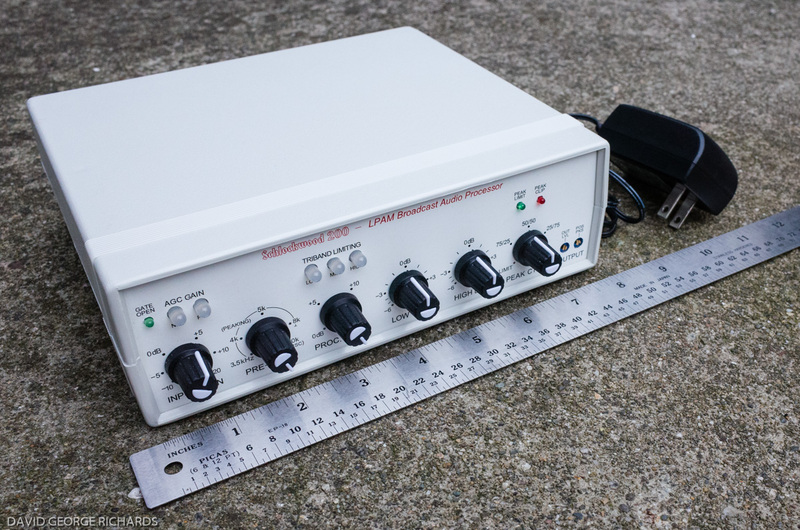 Again a very low power audio amp was all that was needed, and there were no 'inertia' issues to worry about it. But I was soon to suffer a setback. 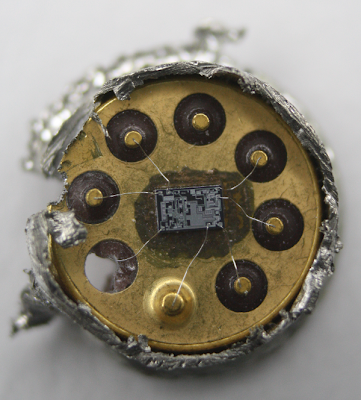 A few days later the headlamp reflector, sitting on a desk in my bedroom, managed to find itself in a position to focus the suns rays onto the cork holding the photo-transistor. Cooking the transistor & setting fire to the cork. Luckily my mother smelt the burning cork before any collateral damage was caused but I had a face-chewing when I came home from school. I'd long since forgotten about all this until reading the later chapters of your book. Simplicity + Serendipity = Elegance. Indeed it does. I would also point out that Peter's rig contains an admirable dose of ugliness (in the positive sense). Thanks Peter! I had to pass along photos of the latest work of Mike Bohn, KG7TR. 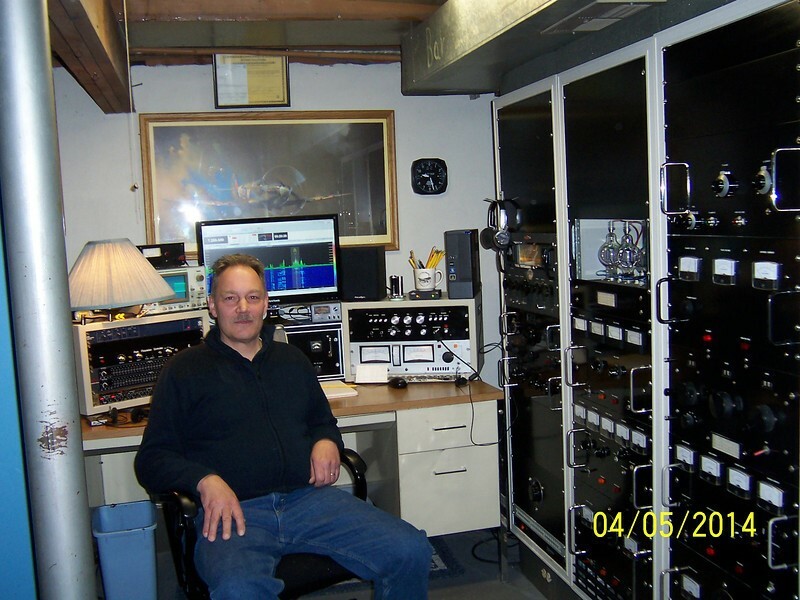 Mike is a long time thermatron home brewer, having built several SSB receivers and transmitters. He is famous for his “octal mania” designs that only use octal tubes. His present SSB transceiver is no exception. Some of his work is shown in my HSD book. This is way more time than most of us who still work ever hope to devote to a homebrew project, but it gives me hope. Someday we will hopefully retire. 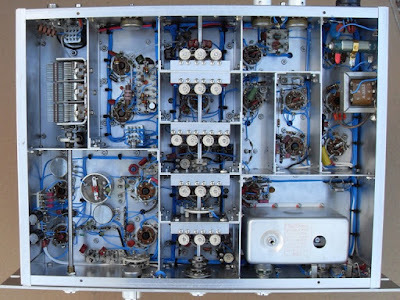 This is a 80,40,20 meter rig with a pair of 6146’s on the output. Tuned the good old fashion way with 5-5.5 Mc L/C colitis oscillator. 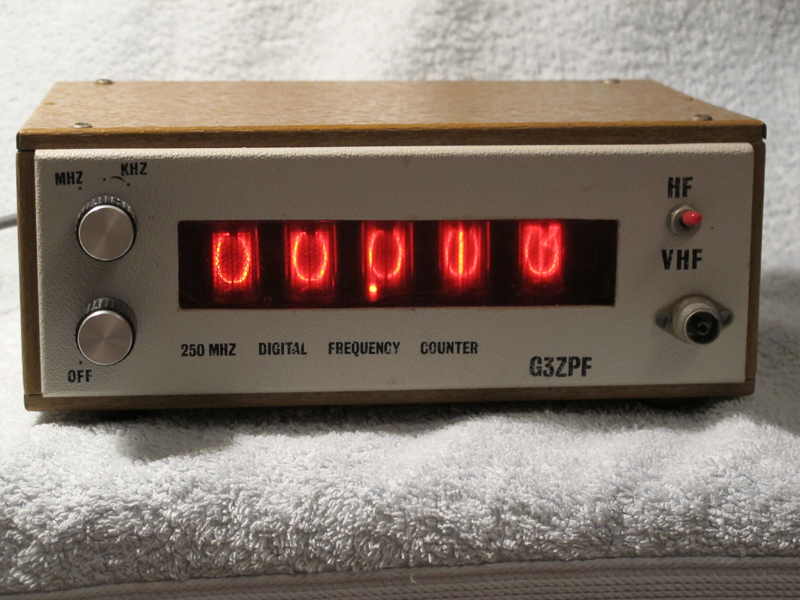 It does have an IC freq counter as the frequency display. Even though the metal work looks like it was done in a well equipped machine shop, Mike says “The sheet metal work was pretty onerous. I don't have the tools to shear metal or make right angle bends, so everything had to be done with a jig saw, angle stock and files.” This also give me hope, but I have a hard time believing he doesn’t have a numerically controlled, laser mill! Thanks –you have ruined my day –almost wants me to take all my radios to the scrap heap. 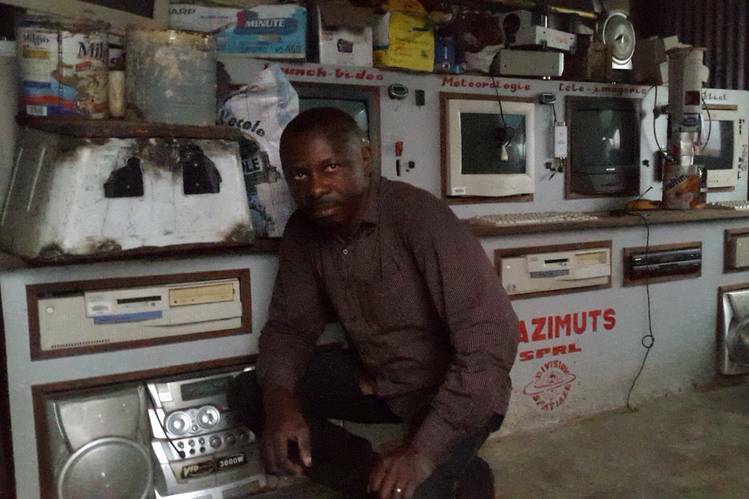 Those are not radios but works of art. Lots of man hours in those projects and more amazing is finding many of the parts – the thermatrons are easy to find –it’s the other stuff that is nearly unobtanium. 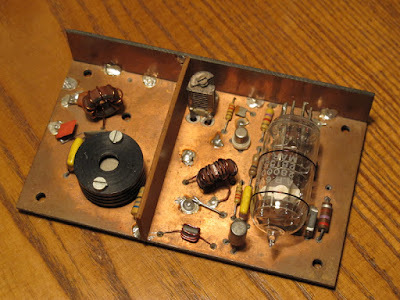 M1GWZ writes: "Just to establish my DIY radio credibility, here is a photo of my contest-winning crystal radio. Unpowered, it has logged commercial stations from Ireland to Russia, and from Northern Norway to Algeria. Excuse the mess in the background - the workshop is being re-organized!" Carissimo Bill (I don't speak Italian. I'm just showing that I have read the book). One of the benefits of early retirement after ten years in the electronics industry and twenty-five as a University academic is that one gets the chance to research one's interests and also have time to experiment with them. You correctly comment that you doubt you will have trouble occupying yourself in retirement - this is true, but be prepared for the frustration of not making as much progress as you would hope for! Chores still steal your time from you - and you have no excuse for avoiding them when you're retired. I was recently alerted to the availability of your book via Kindle, but have only just got around to reading it (retirement...). It has been both a joy and a curse. Congratulations! It made fine reading in a couldn't-put-it-down way, but has also added several more items to my already-arm-length retirement project list. This, of course, is the price one pays for education and for evading the curse of boredom. As a radio ham friend of mine says with a sigh, "So many projects, so few lifetimes." As a result of reading your book, I am now pursuing satellite communication with my Yaesu handheld, and will put together a dedicated homebrew Yagi-plus-transceiver system in the New Year. The Baofeng two-bander handheld can now be had for £18 in the UK, so I can afford to dedicate one to the system permanently. Cheap technology to talk via satellites! So far, I have just been listening in - for the last three days. Apart from amateur radio and DIY discrete-level DIY electronics, it turns out that we might have a couple more things in common. 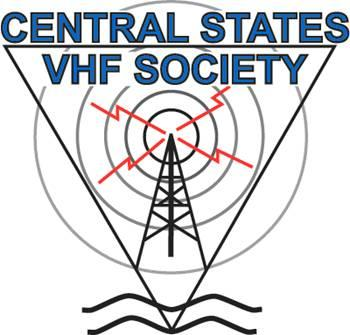 Through visiting the Dayton Hamvention, I now have many friends via the AMRAD club around Washington DC and have met quite a few hams from the Vienna and Loudon groups. I have attended Dayton for about the last fourteen years but circumstances change and we might now decamp to February's Hamcation in Orlando. Meanwhile, I live about four miles away from Kempton Park and have attended most of the rallies there, so there is a good chance that we two may at least have occupied the same room, albeit without actually meeting, on at least one occasion. It's a small, beautiful world. 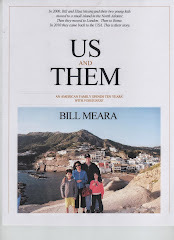 Anyway, you're a busy man and I'm a verbose retiree, so I just wanted to thank you for the book and the inspiration it has given me to do more in ham radio. I also build DIY audio projects including (music) synthesizers, but at least I can use up a few more junkbox components before they're used to weigh down my coffin. I picked up along the road, and was thus an easy mark for misdirection. radio exam, and trotted out repeatedly in the RSGB magazine. showing variation of feed impedance with height. changeable and usually awful the UK weather is) had been utterly pointless. thing with a balun on the back. time when nobody distinguished between a voltage balun and a current one. 20 years and current baluns are the way to go. Its tough being a visionary. makes on a pale grey bedroom carpet. When GQRP first started up a bunch of us locals used to have a 10m net. meant the matching was easy to 50 ohms. was a valve sig genny. noise floor on 10m. Not much chance of that now. the other it couldn't happen. couple of hours for it to appear on our TV news. to your CQ while screwing the trimmers on their xtals to get co-channel. the road telling all the neighbours her lad was talking to England. Life seems a lot more cynical these days. grandkids don't 'get it'. They're happy with Skype, facetime, and TXT. saying "grandad, can I have that telegraph key when you're dead?". kinda cool". Now he's 20. Bought his first apartment, and his first BMW. Making his way in the world and glued to his iPhone. if you slide them past each other you can gget DSB or AM. it. Maybe I'll get it onto kindle one day. grandkids and my 94 yr old mom I have less time than when I was working. Travelogue: In Shenandoah with BEARS! Michigan Mighty Mite Update and a Generous Offer (with conditions). Elser Mathes Cup -- We have some competition! Si5351: G4GXO says give it a go! Since October 16, the SETI institute has been using its Allen Telescope Array to observe KIC 846 2852 over a wide range of radio frequencies (1 to 10 GHz), looking for any artificial signals. Keep in mind that this star system is relatively far, roughly 1400 light-years away. That's more distant than the Orion Nebula, and getting there (if you feel the need) would require a 23 million year ride in our fastest rocket. But more to the point, any signals detectable here on Earth would have to be exceptionally powerful. We're continuing to analyze the data. 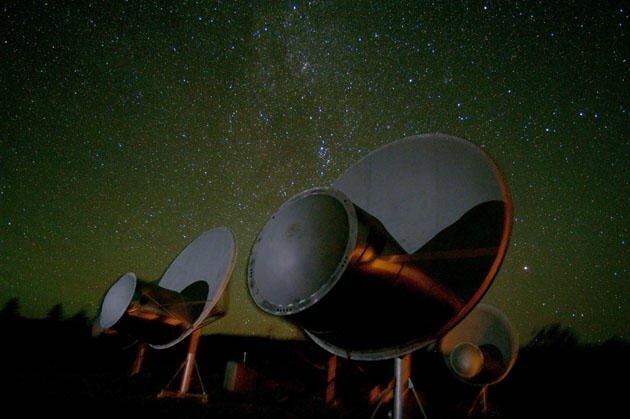 In another week, our SETI team will once again observe KIC 846 2852 using some new receivers being affixed to the Allen Array - known as Antonio feeds - that will increase the sensitivity by a factor of two. Check this space. Meanwhile, consider KIC 846 2852 as something suggestive of cosmic company, but no more than a suggestion. The Class E rig is very tempting. But no way on the ebay! Too much of an appliance -- it even looks like a refrigerator. I pulled an old Eico 435 'scope out of retirement. I hope to use it as a modulation monitor (any suggestions on easy ways to hook it up for this purpose?). I really like the grey and aluminum look of this station. I tried putting a DX-60 on the same bench, but the green of the "modern" Heathkit clashed with the serious-radio look of the DX-100 and HQ-100. Thanks again to Tim Sutton for the aluminum boxes -- I am temporarily using them as supports for the D-104 and the 'scope. You see, I'm standing up when I modulate this gear. Somehow it seems right. Also, the transmissions on AM are so long that you can go back to your chair and rest (a lot!) between your transmissions. When your turn comes, the few seconds it takes you to get to the rig provide the customary (and polite) "dragging of the feet" that allows others on the frequency to announce their presence. Then comes what is perhaps the most fun part of this setup: the AWESOME KERCHUNK sound of the DX-100 going from receive to transmit. As you can see, we pay a lot of attention to aesthetics and radio ergonomics here at SolderSmoke HQ. That little blue recipe box holds my AM contact card file from the 1996-2000 period of operations from Northern Virginia. I'm planning on doing a little work on the DX-100. 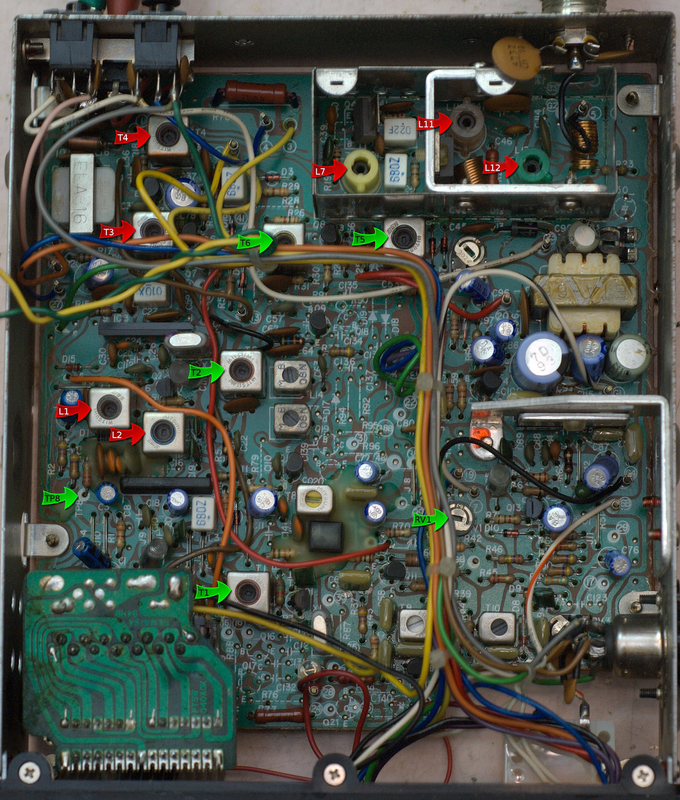 There is a standard set of mods to the audio amplifiers, mostly just changing some caps. And I need to find out why some of the crystals are not working -- I suspect dirty contacts. I might also change the mic connector. 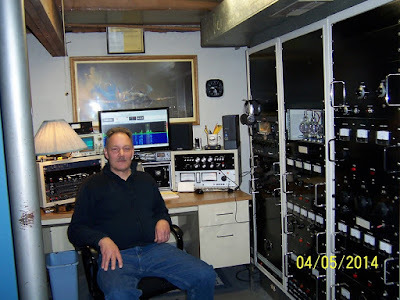 Looking ahead, Steve Silverman KB3SII (SolderSmoke Lex-pert), Pete Juliano N6QW and I have vague plans for an assault on 160 meter AM. And Now for Something Completely Different: Boatanchors! AM! Top Band! Lately I found myself looking for something different to get involved in. Pete's conversion of his Ten-Tec commercial rig got me thinking about converting an old CB rig to 10 meter AM. I'm still planning on doing this, but noodling on this project got me thinking about AM in general. I had the DX-100 that John Zaruba K2ZA had given me (it was his dad's). I had it paired up with an old HQ-100 that I'd picked up in the Dominican Republic 20 years ago. (Looking at the old manual for this receiver, I realized that there is another reason why I feel so connected to it: it was built on West 34th St. in New York City, not far from where I was born.) On Veterans Day (November 11) I connected these two old Boatanchor veterans to my 40 meter dipole, rigged up a connector for my Astatic D-104, and fired up on 40 meter AM. I had a blast! 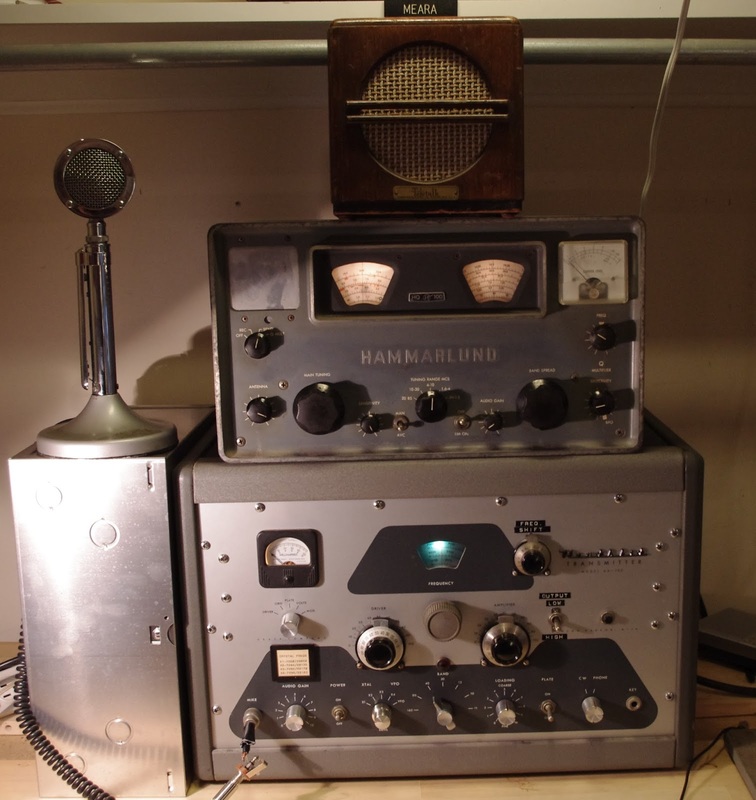 I found myself in contact with hams who are interested in the inner workings of their gear, guys who know which end of the soldering iron to grab. The DX-100 got great reports -- people said it sounded nice. Sam K4NDY told me that his DX-100 had started out at 100 pounds, but that as time passed (and as he has gotten older) he noticed that it has somehow increased in weight! Mike KC2KJ was running a DX-100 and a Drake 2B. FB! Steve W3DEF was on with his B&W 5100B. Dave W3CRA was on from the Collins Radio Association. He restores Collins gear. When he told me the DX-100 sounded great, I knew that it really did. I had been thinking vaguely about someday getting on 160 meters -- I've never used those frequencies. Yesterday I noticed that both the HQ-100 and the DX-100 cover this band. THE RADIO GODS HAVE SPOKEN! I ran across a reference to the SolderSmoke book and read through it very quickly. 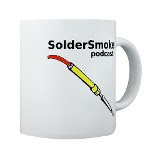 Through the book, I discovered the SolderSmoke podcast and have been enjoying every minute! I just want to thank the two of you for the inspiration and new motivation I’ve found in a hobby I’ve loved for 25 years! I’ve never tried homebrewing anything but that’s about to change. It took me a while but we have oscillations on or about 14.060 MHz! 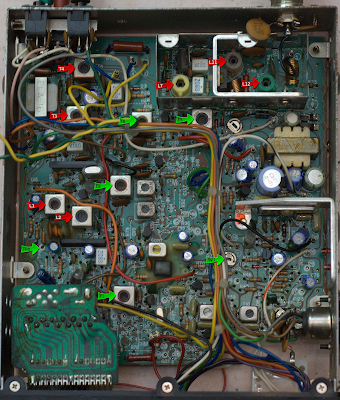 I adjusted the circuit to use resistor divider biasing of the 2N2219 and changes to the biasing and coil to accommodate the 20m crystal. Also the only cap I had that worked was a 10-50pF trimmer. Aside from my placing the crystal in the wrong point in the circuit because I wasn't paying attention, this Michigan Mighty Mite needed minimal tweeting. The antenna is a 50 ohm resistor which the KX3 heard very well with its attenuator in line. Now my problem is that I listen to SolderSmoke in the car and it's bad form to take notes and drive at the same time. Also, I find myself wanting to experiment with all of the ideas from the podcast at once... If I build your LBS in modules, Pete, then I can experiment later and swap circuits to my hearts content. One question for now...where is a good source of plentiful, inexpensive crystals? My name is Eric Melling KD0OXY. I have, as of tonight, officially passed selection for the CLA. My Michigan Mighty Mite began oscillating tonight between 1830 and 1900 CST and I am ecstatic about it! My foray into home brewing began mid-2011 when I obtained my general class ham license (I took Technician and General at the same time taking advice from my late grandfather). The first radio I ever purchased was the Pixie II kit and boy was that frustrating. I meticulously assembled the kit and worked very hard to stuff the transceiver, volume control, options to use the on-board key or a straight key, and maybe an on-board speaker or phones. But, to my chagrin, I was treated to the sweet wafting smell of the magic smoke long before ever getting on the air. I eventually did get on the air with my aforementioned grandfather's VHF/UHF HT and until recently, this has been the extent of my Ham career. But on the advent of my starting an MA in applied linguistics at a school in Dallas (hour and a half from home in Waco) and the rekindling of my electronics knack occurring near- simultaneously with my discovery of the SolderSmoke Podcast, I decided to give it another go. First, I got the old pixie kit to oscillate and then ripped it apart for parts to another project (non-radio). Then I procured a second Pixie kit from ebay and built that. It oscillated right away! Still no contacts; my CW is... improving. All this to say that I still had an itch that wanted scratching Enter: The Color Burst Liberation Army! Not only could I truly build something from scratch, I could follow my true calling and de oppresso liber some crystal. So I pulled some 30 (or so) gauge magnet wire from an old CRT. I had wound and rewound my coil three times (and unfortunately, the third one looks the worst) for 80m then 20m (far fewer turns) and back to 80m with N'JOO (No Joy of Oscillation) in any configuration. 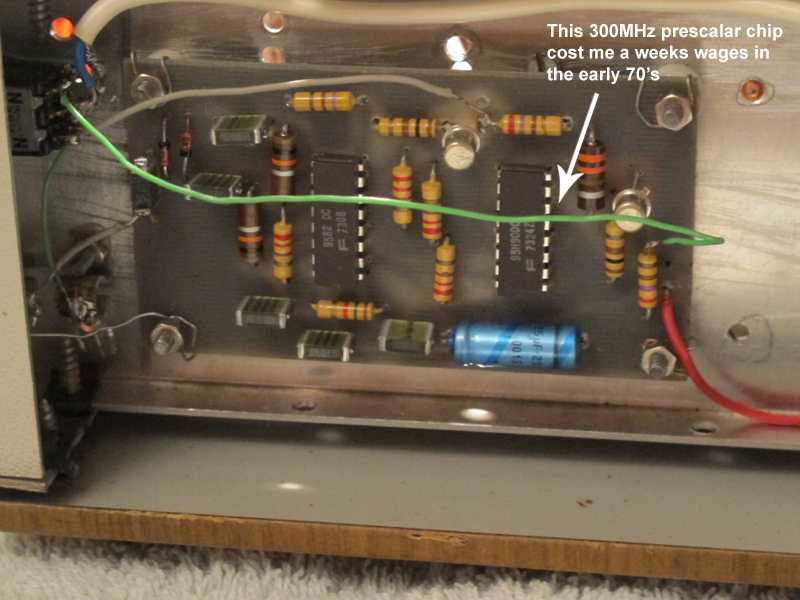 I am using a polyvaricon pulled form an old AM/FM transistor radio, the Mitsumi PVC-2FX which has 82 pF, 140 pF, 20 and 40 pF sections which I have wired in parallel giving me ~0-282 pF of range? And finally, I was using a MPS A42 NPN transistor. I had to run some resistors in parallel and some caps in series to get the right values, but I eventually got it all together and looking pretty smart on a 1" x 1.5" piece of perf board. Alas! Nothing! Probably more than you wanted to hear, but there it is. 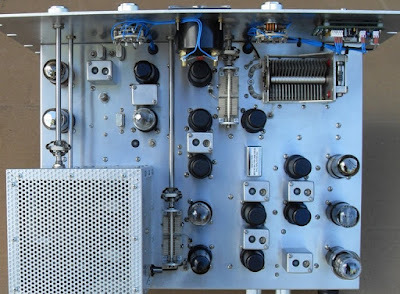 I do plan to build an SSB transceiver someday (hoping sooner than later). I feel you and Pete and your podcast have really set me out on the right foot! I hope to HB2HB with you soon! Psst... I know a guy with some caps.... Variable caps... Real beauties.... But only for Mighty Mites. Feast your eyes my friends. That is 400 micro-microfarads of variable capacitance. (400 picofarads for you sophisticated young folks.) A benefactor interested in expanding the ranks of the Color-Burst Liberation Army has stepped forward to make us an offer that is hard to resist: He will send ELIGIBLE recipients one each of these fine electronic components for the cost of postage (approximately 6 bucks in the USA). He has specified that ELIGIBILITY is limited to those who need this part to build or complete a Michigan Mighty Mite. And I have been appointed "Grand Poobah and Chief Arbiter of Capacitor Eligibility." So here is the deal: Send me an e-mail telling me about your planned or stalled Michigan Mighty Mite project. Include some information about your personal "Knack Story" -- tell us why you share in this strange compulsion to build a largely useless 250 mW 3.579 MHz oscillator. If I find your plans believable and your Knack Story compelling, I will recommend you for a capacitor. Purely aspirational MMM projects and obviously fabricated Knack Stories will not make the cut. Supplies are limited, so act now! FB Stuart! Great work. 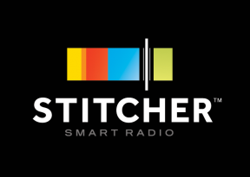 Pete is sending you info on a Low Pass filter that will clean up that harmonic-rich signal. When you are done, be proud of what you have accomplished! Use it on the air and show it off to your friends an amaze them. Then clean the bench and start dreaming about your next project. Make a preliminary simple design, document everything you do! Build in modules! Make one module at a time work. There is a lot of tribal knowledge and homebrew wisdom in this link. I tried to find a picture of OM Dave, but he has kept a low profile on the www. The best I could come up with is a symbol of the club that he has been associated with. Thanks Dave! Miguel PY2OHH is the Wizard of Sao Paulo. This morning I was looking at his wonderful web site and came across this little rig. It seems a bit simpler than our beloved Michigan Mighty Mite. And the folks down in Brazil had several of these on the air and made contacts with them. FB. 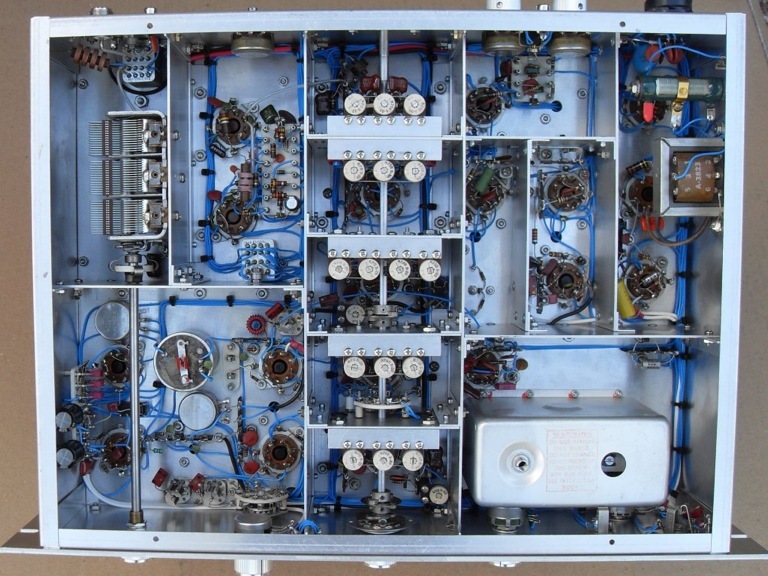 Miguel hints they may turn this rig into a transceiver. Yesterday I was talking to Allen W5SQK on 17. He mentioned that he been working in his shop. You don't hear that too often these days, so naturally I asked what he was working on. Turns out that OM Allen is building a coffee can radar! He is enrolled in the MIT Lincoln Lab's Open Courseware Project (which looks very cool). 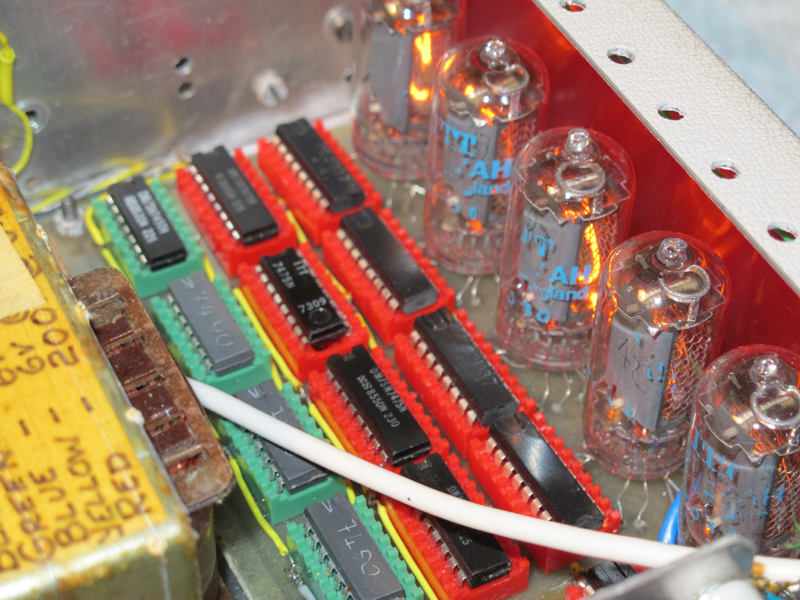 We had a great QSO, sharing tales of woe about the release of magic smoke from (dis)integrated circuits. These are the things that pull us together my friends! On the MIT page the name of a faculty member caught my eye: Dr. Gregory Charvat N8ZRY. Greg's rigs have been discussed on this blog at least twice, but it wasn't until today that I became aware of his many other interesting technical activities. Google Chrome does a pretty good job translating from Turkish. Nightmare Turns Real: "Rig Here is a Raspberry Pi OM, and I'm listening to you with my Dongle..."
As with many other nightmarish things, this one was launched at the world on Halloween. It all seems a bit flaky, but we knew this was coming. Don't complain to me about the lack of low-pass filters, SSB testing on 7.000 MHz, or the rather nebulous identity of the creator.... I'm just the messenger here. And remember that I am a HARDWARE Defined Radio, Discrete Component, "Menus are for Restaurants" and (now) "Pi's are for eating" kind of ham. A lot of trouble can begin with a 5 dollar purchase, as I found out after I bought a nickel bag of CB at a hamfest. The embarrassing little Good Buddy appliance has been hidden away in my junkbox for a while. I pulled it out after watching Pete's videos about the conversion of his Ten-Tec Model 150A commercial rig. 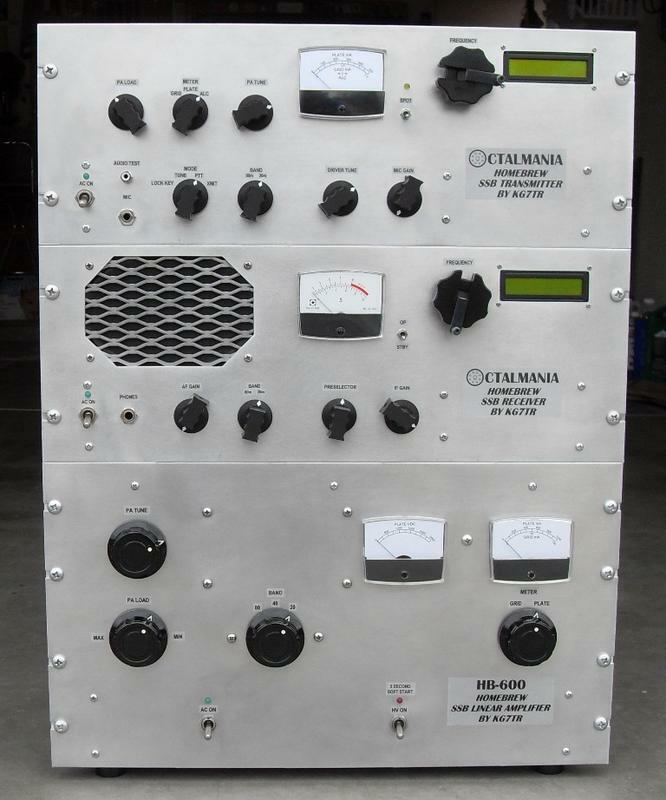 I thought perhaps I could use a little DDS or PLL board to bring that CB rig onto 10 or maybe even 12 meters. The first thing I noticed when I opened it up was the smell -- there was a very strong chemical electronic smell. 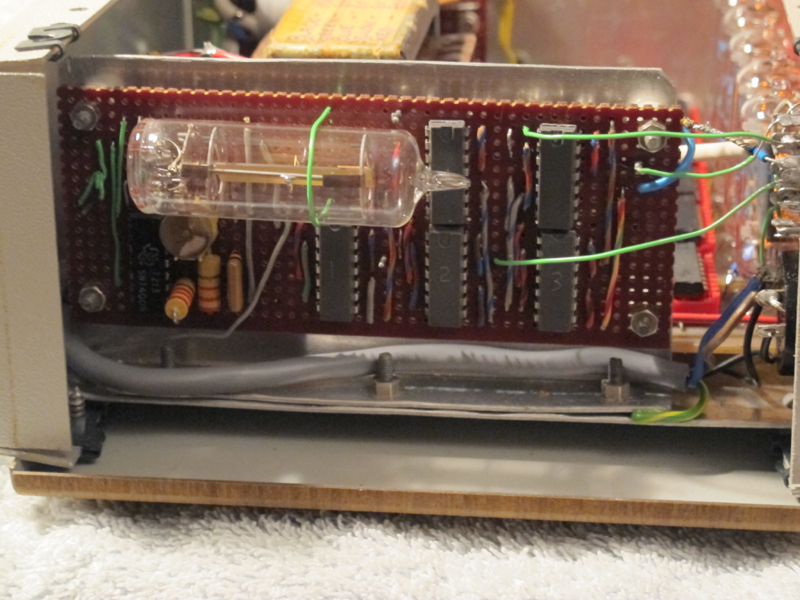 It was as if components and wires and adhesives and PC boards had been venting inside that case for several decades. This wasn't that pleasant electronics smell that you get from a Drake 2B or a DX-100. No, this was different. It gave me a bit of headache. That's a bad sign. I began to wonder if the Radio Gods might be sending me a message. Wow, a few snips, a few jumper wires on the PLL board, and a few coil tweaks and that thing would be on 10 meter AM. I also learned that the "Cybernet" board that was stinking up my shack was VERY common in CB rigs, so there is a lot of info about it on the internet. This thing seemed to be crying out for a quick and easy conversion to ham-dom. So I don't know which way to go with this one. I'm getting contradictory signals from the Radio Gods. What do you guys think? Garbage can or workbench? Imagine how difficult it would be to make any progress on something like this in the Democratic Republic of the Congo. Godspeed Jean-Patrice! This is really cool and potentially life-changing for radical fundamentalist ludite homebrewers. As our readers will know, my big objection to the use of integrated circuit chips is the fact that these little black boxes are in fact often, well, little black boxes. We don't know what is going on in there. It seems to me pointless to shy away from the use of large black boxes (the extremely complex "radios" that dominate the amateur airwaves today) only to fill our homebrew rigs with smaller black boxes. But when we crack one of these boxes open and take a look at the transistors, resistors, and capacitors formed on the substrate, then diagram it all out, I think the fog of mystery is blown away by a refreshing wind of insight and understanding. We saw this happen on a much smaller scale when someone cut open an SBL1 mixer, but that wasn't an IC. 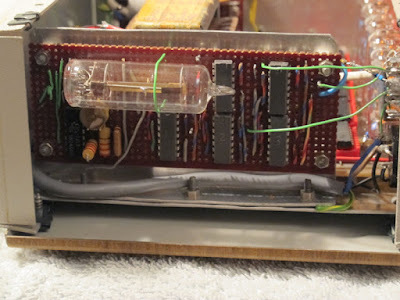 Ken Shirriff has now done this with the venerable 741 Op Amp. And he did it with a hack saw. Bravo Ken. I can now in good conscience uses 741 op amps in my rigs.